About us | RV There Yet? Welcome to RV There Yet! First the facts – I’m a sixty-something early retiree who is living in a 39 ft motor home with her husband of 47 years. I hesitate to even call ourselves retirees, since what we did was really just quit our jobs and run away from home. The kids were (mostly) launched, the house was too big, and it seemed like a perfect time to take a little sabbatical to celebrate staying married through kid-raising, old house renovating and small business operating. So we sold the house, shut down the business and set off for a one (or maybe two if we were very careful with our finances) year adventure before we settled back down, purchased a small house and found jobs at Home Depot and the local fabric shop. That was in August of 2004. What began as an adventure has become our life. Our hometown friends have stopped asking when we’ll be back, and our grandkids only know us as the grandparents that come with their own house. What really changed our adventure into a lifestyle and ministry was the realization that traveling around the country just being tourists was a bit tedious. And expensive. It only took us about 6 weeks before we knew that we needed to do something with our days that had some purpose. We had joined a ministry called SOWERS – Servants on Wheels Ever Ready – which does volunteer service work at different Christian ministries – before we left home with the expectation that we would work one or two of their month long projects along the way. We did our first SOWER project at a small Christian school in central Georgia in October of 2004. And we were hooked! God did a work in us and we were changed from tourists into servants. And we have never looked back. So far we’ve done yard work, new construction, painting, sewing, A/C and refrigeration work, ditch digging, cooking, filing, tutoring ….the list goes on and on. We’ve been incredibly blessed to be a part of this ministry as it has enabled us to be useful and see God at work while traveling through this beautiful country. Thanks again for stopping by! Hope to see you down the road! Hi there! I did a search for the title “RV There Yet?”, to see what’s out there because I want to title our blog that…and I found several out there. I see that you and your husband are members of SOWERS. 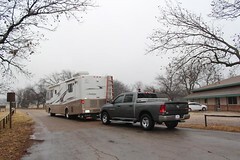 My hubby and I are interested in serving the Lord once we get on our way in our motor home. We are brand new RVers, will be taking a short trip in a week or so, to get our feet wet, so to speak, then then end of April we plan to take off on a long trip until October. We live in Tucson, so I am looking forward to being away from the oppressive heat for the summer. Happy Trails! Hi Stephanie! I’m delighted to find your blog. We’ve been waiting on the Lord (not very patiently) to do what you do. We’ve been trying to sell our house for three years now, so we can set out and hopefully, be a SOWER like you. We won’t know if being a SOWER is for us until we try it, but we’re thinking it’s exactly what will work for us, too. Until our time comes, I will return to your blog often, learning all I can about SOWERS. We live in South Carolina, near Savannah GA. We are waiting for my second round of fingerprints to come back and then we will be submitting our application. I can’t wait to read ALL your entries and someday meet you. God bless you! Hello, Sandi! So glad you’ve found our little corner of the internet. Do not be discouraged about the house thing – we were in the same boat! But He is Faithful – and here we are, 11 years later! Hopefully we will meet down the road – that would be grand! God bless you as He works out the details of your departure! Hello, Dianne! Thanks for stopping by our little corner of the internet! If you have any questions about SOWERS or the RVing life, feel free to give me a holler! We, like you, were brand new RVers when we started out, having NEVER done any camping before we purchased our motorhome and took off! Now I can’t imagine anything else! So glad the God had this in store for us! Blessings to you and your family! I introduced myself on March 8. My credit card has been charged for the FBI fingerprints, so we know the (second) report is in the mail. In response to that, I asked the pastor to send his letter and the application has been finished for a long time, almost a year. As soon as the fingerprint report arrives, the application will go in the mail. Hallelujah! But the house is still an issue. We have to do some work on it this summer, so prayfully, it will sell in the fall. Our time will come, I know. Have a wonderful day in the Lord!